I took the easy way out with the background, I think it turned out okay. Dr. Shearer is the one dressed like a human and the rabbit is the one that looks like a rabbit. “Well, eef you ‘ave Hanes your way, will you send eem back to duh Shearer farm? Aum starving, I’m gonna find my way home.” The rabbit padded out in front of Dr. Shearer, “don’t go on an empty stomach, mate; take some kale with you.” The rabbit ran to a patch of kale. Dr. Shearer winced. “Oh, dun be like ‘at, try some. Kale from dees woods is magic’ly delicious.” The rabbit handed Dr. Shearer a wad. Dr. Shearer took a bite and started floating. “Eet’s the most ‘elicious thing auve evah tast’d, tha’ ees. Me mum’s kale ees soggy and bi’uh. 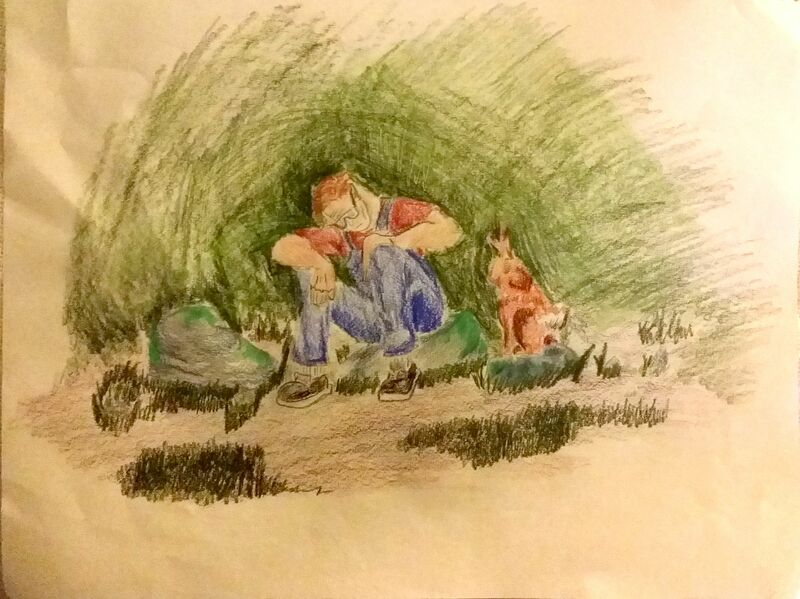 auh theenk auh will stay ‘eere for a tick and ‘ave moor.” The rabbit nodded. Hours turned into days, days turned into weeks, weeks into months, months into years. Dr. Shearer so loved that kale and all the other rabbit food that he forgot about home. After living with the rabbits for 25 years, Dr. Shearer decided it was time spread the wonders of kale and a plant based diet. So he went to medical school (he was valedictorian of his warren, he got lots of scholarships). Soon thereafter, he came to work at the Good Shepherd Community Clinic, where he met Jarrett Wilson and quickly became one of Jarrett’s favorite rab…err, people. Like Emily, the occupational therapist, Dr.Shearer occupies space in my head and tells me what to eat. For being the rabbit inside my head, Dr. Shearer is one of my favorite people.